^ Erowid AET (alpha-ethyltryptamine) Vault".""". ^ Blough, Bruce E.; Landavazo, Antonio; Partilla, John S.; Decker, Ann M.; Page, Kevin M.; Baumann, Michael H.; Rothman, Richard B. (2014). 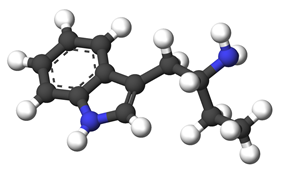 "Alpha-ethyltryptamines as dual dopamine–serotonin releasers". Bioorganic & Medicinal Chemistry Letters 24 (19): 4754–4758. ^ Huang XM, Johnson MP, Nichols DE (July 1991). "Reduction in brain serotonin markers by alpha-ethyltryptamine (Monase)". European Journal of Pharmacology 200 (1): 187–190. ^ Gillman, P. K. (2005). "Monoamine oxidase inhibitors, opioid analgesics and serotonin toxicity". British Journal of Anaesthesia 95 (4): 434–441. "Drugs such as MDMA, ecstasy (3,4-methylenedioxymethamphetamine), if combined with MAOIs (including moclobemide) do also cause fatalities because they act as serotonin releasers,"